Motorola announced its latest mid-range Moto P30 smartphone in the new ‘P series’ in China. It sports a 6.2-inch Full HD+ display with 19:9 aspect ratio. It is powered by Snapdragon 636 with 6GB of RAM and runs on Android 8.1 (Oreo) with ZUI 4.0. It features glass back with gradient design and Corning Gorilla glass protection on the front and the back. It packs a 3000mAh battery with support for 18W fast charging. It has AI dual rear cameras the primary is a 16 MP camera with f/1.8 aperture, 1.25μm pixel size and secondary is an 5 MP camera to capture depth information in portrait shots with AI support. On the front side it has a 12 MP camera with AI beautification and AI face unlock. The mobile sports a 6.2-inch (2246 × 1080 pixels) Full HD+ 2.5 curved glass display with 19:9 aspect ratio with Corning Gorilla Glass protection. It is powered by 1.8GHz Octa-Core Snapdragon 636 14nm Mobile Platform with Adreno 509 GPU and runs on Android 8.1 (Oreo) with ZUI 4.0. The device comes with 6GB RAM with 64GB / 128GB internal storage. The storage memory can be expanded up to 256GB using microSD card. On the front side it has 12MP front-facing camera, f/2.0 aperture, 1.25μm pixel size. The mobile supports 4G VoLTE, Wi-Fi 802.11 ac (2.4GHz + 5GHz), Bluetooth 5, GPS + GLONASS. It has Hybrid Dual SIM (nano + nano / microSD) and comes with 3.5mm audio jack and Dolby audio. It also has Fingerprint sensor and also comes with Face Unlock feature. The mobile 3000mAh battery with fast charging. The dimension of Moto P30 is 155.8×75.95×7.69mm and weight is 170g. 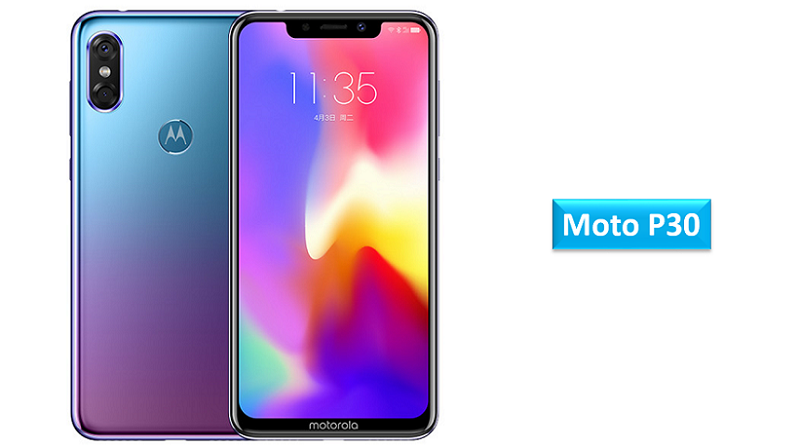 The Moto P30 comes is priced at 2099 yuan (US$ 303/Rs.21,315 approx.) for the 6GB RAM with 64GB storage version and it costs 2499 yuan (US$ 361/Rs. 25,380 approx.) for the 128GB storage version. It will be available in White, Black and Aurora Blue colors. Motorola is expected to introduce P30 Note and P30 Play soon. Share your views with us on Moto P30 smartphone in the comment section below.